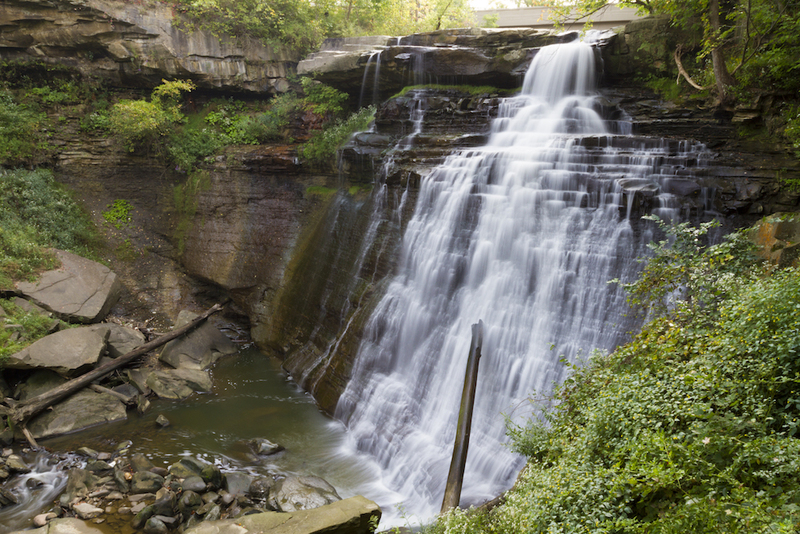 Inside Cuyahoga Valley National Park, through a deep secondary growth forest, a narrow trail skirts the infamous Cuyahoga River following the historic route of the Ohio & Erie Canal. This is the same path used by mule drivers to tow canal boats loaded with goods and passengers when the state of Ohio was a sparsely settled wilderness. The Hopewell and Ojibwa and Seneca made their homes here until 1805, when treaties stripped them of their ancestral lands and forced them out of the area. Today the valley is a 51-square-mile nature preserve stretching from the Akron suburbs in the south to the Cleveland suburbs in the north. Waterfalls, rolling hills, caves, narrow ravines, boulder-strewn cliffs, rolling floodplains, and lush farmland create a stark contrast with the densely populated metropolitan area around it. As a bicyclist I try to visit the valley at least twice a week to find inspiration in its solitude and to enjoy some sessions of sweet silent thought. Along the towpath I regularly spot bald eagles, peregrine falcons, and great blue herons with Jurassic wingspans. Typically, I have to share the path with queen snakes, spotted turtles, and industrious beavers building their dams in a nearby marsh that was once a junkyard with a small stream flowing through it. On one of the many hiking trails through the steep woodlands, the sharp-eyed can spot the occasional black bear or bobcat, or a pack of coyotes hunting for rodents and rabbits and unfortunate toy poodles. Visitors are urged to keep their dogs on leashes at all times. The park is an idyllic setting that seems a world away from the dark, satanic steel mills and the sulfur-spewing smokestacks that crowd the riverbanks in Cleveland’s industrial flats. For 10 years, on and off, I worked in those mills as a union boilermaker, earning my way through college and graduate school. At 7 a.m., with an acetylene torch in hand, I would climb into the black asbestos pit of a dust collector and begin cutting through enormous pieces of warped and rusted metal, all the while thinking of my unsmiling professors and how they remained unimpressed by the latest draft of my master’s thesis, an unwieldy tome by a 27-year-old pseudointellectual who’d fallen under the sway of Joseph Campbell. Yes, the fiery embers hurt, the falling pieces of jagged scrap metal hurt, the deep cuts from power grinders hurt, but always above the roar of the blast furnace I heard the opera. Below me toiled the enslaved Nibelungs harassed by invisible foremen while I sang the part of Siegfried, hammering a sturdy sword of scholarly pretension. I couldn’t decide which was more absurd—the neuroses of academic life or the physical dangers of blue collar work. Both seemed hellish and bizarre, equal parts vaudeville and Wagner, completely untethered from anything most people would recognize as reality. On those rare days of bright sunshine and yellow smog, I stood on a platform at the top of the refinery where I could see, to the north, the skyscrapers of downtown Cleveland and, to the south, the thin white line where the towpath followed the river and eventually disappeared, five miles away, into the lush treetops of the national park. After work, the men poured from the gates of the mills and then went straight to one of the dank dive bars at the corner where they cashed their checks and in stoic silence drank shots of whiskey and mugs of cheap draft beer. I rarely joined them. Instead, I had to fight rush-hour traffic and race to night classes at Cleveland State University. If time permitted, I would stand under an icy spray of water in the athletic center’s locker room, washing away the sparkling graphite dust and scrubbing the stubborn black soot that ringed my eyes and mouth. Later, sitting in the classroom and fighting the temptation to sleep, I would patiently take notes on Mailer and Roth and Updike, how each boasted of his sexual conquests, and sometimes, if the Indians were playing and Manny Ramirez had hit another home run, I would hear the celebratory explosion of fireworks from the ballpark 25 blocks away. Driving home from school, I would pass through Playhouse Square, the largest performing arts district in the United States outside New York City. Near I.M. Pei’s glass pyramid for the Rock and Roll Hall of Fame, I would turn onto the West Shoreway overlooking the guano-splattered break wall and the tumultuous lake. Measured by surface area, Lake Erie is the 13th largest lake in the world, but it’s the shallowest of the five Great Lakes with an average depth of just over seven meters. As a result, it’s the roughest of the lakes and can kill an exhausted or inexperienced swimmer quickly. Invasive species like the zebra mussel (Dreissena polymorpha) are beginning to thrive here, but the lake is still healthy enough to sustain a fishing industry that supports 10,000 jobs. In recent years a toxic algae bloom, fed by nitrogen and phosphorus-rich runoff from Ohio farmlands, spread east from the lake’s western basin, depriving the walleye of oxygen and turning the rolling waves into the color of cold hard cash. While it was a public relations catastrophe for what was at one time the fifth-largest city in the United States, the fire did help spark the modern environmental movement and the passage of the Clean Water Act. In 1970, to celebrate the inaugural Earth Day, a number of Cleveland State University students marched from campus to the river. In the decades that followed, the Cuyahoga’s water quality has improved dramatically, and business investors have converted parts of the Flats’ abandoned industrial cityscape into an entertainment district featuring restaurants, nightclubs, and music venues. What’s true for the Flats is true for much of downtown Cleveland. As a result of winning the bid for the 2016 Republican National Convention, the city has undergone a massive capital improvement project, with the fixing of roads and bridges and public buildings. The arriving delegates will see some of this: 275 new trees will spring up in the city; 250 planters filled with flowers and greenery will decorate the streets; murals and art installations will pop up all over town; 1,000 banners will hang from street poles; 1.5 million individual twinkle lights will gleam around the perimeter of Public Square and the lakefront and the arena where the convention is being held; bars and restaurants will stay open until 4 a.m. And a grant from the United States Bureau of Justice Assistance will pay $50 million to keep 5,000 police officers on duty during what is sure to be a violent political carnival. As a novelist and unapologetic introvert, I’ll avoid the mayhem—the trendy bistros and crowded microbreweries and open-air amphitheaters and designated protest zones. I prefer to ride through the national park 10 miles due south. Yes, the thousands who will soon descend on the city may find the vibrant boardwalk along the downtown riverfront a refreshing glimpse of nature. But it cannot compete with the sense of grandeur one experiences while hiking through the national park. Kevin P. Keating is the author of novels The Captive Condition and The Natural Order of Things. He teaches at John Carroll University and Baldwin Wallace University near Cleveland, Ohio.